My lovely readers, I know I have been away for a while. I have been traveling on a road trip for the last week with no internet access and therefore have been unable to update this site and read up on all my favorite blogs. I finally have internet access (woot!) now and I promise I will catch up on all the posts I have missed. I also have some news...I got a job! Yes, in a few months, I will be finishing up graduate school and moving to the Midwest to teach at a small liberal arts college. I am excited and terrified at the same time. Happy and sad. Relieved and nervous. I'm definitely feeling a mix of emotions right now and this is only the start. It is crazy for me to think about how remarkably different my life will be in a few months, how so many changes are about to take place. And as excited as I am about this opportunity, I sometimes wish things wouldn't change. I've spent the last 5 years of my life in California, and although I'm ready for a change, I know there are many things I will miss about this place. I've mentioned before how great the local farmer's market is here, and I feel almost at a loss when I think about not being able to have fresh and local produce all year long. The best thing about this farmer's market is the variety of produce stands avaialble. Sure there are the ridiculously pricey vendors who try to sell you a tiny basket of organic strawberries for $7, but there are also several vendors that sell pesticide-free produce at prices that are reasonable even for a cheap and poor graduate student like me. Shopping at the farmer's market gives me opportunities to make things like this panzanella salad which was inspired by one of my favorite food sites. The original recipe called for asparagus and leeks, but I substituted spring garlic for the leeks and added fava beans. That is the beauty of this salad. It can be easily tweaked to accommodate whatever vegetable you're craving or, in my case, happens to be on sale! Mix the bread cubes with the garlic, olive oil, cheese, salt and pepper in a large bowl. Toss to coat well. Transfer bread to a baking sheet and sprinkle with salt and pepper. Bake stirring once or twice, until the croutons are crisp and lightly colored on the outside but still soft within, about 10 to 15 minutes. Set aside and let cool. Whisk together red onion, vinegar, lemon juice, olive oil, and mustard in a small bowl. 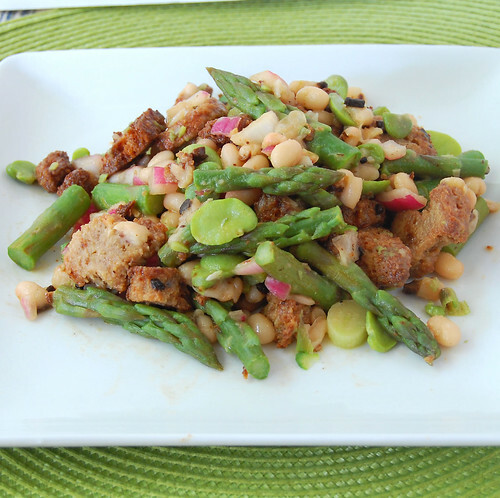 Combine the beans, asparagus, spring garlic (if using), and white beans in a large bowl. Mix in bread cubes, pour in vinaigrette, and toss well. Congrats on the job babe and on the road trip! Sounds like a whole ton of fun (although I'd be lying if I said I didn't miss you...). What will you be teaching? This panzanella looks delicious. SK is the best source for recipes. Hey Ms. Meanie, yeah! Yeah, it's going to be great. Don't worry. It's a new beginning and that can almost always be a good thing. Congratulations on your new job, Hun! And good luck with the big move. I know how scary change can be, but take heart, something wonderful awaits you. I love an adaptable recipe. They're my favorite kind. I usually make changes to the things I make, not because the recipes aren't good enough as they are, but like you, I get what I can afford or happen to already have on hand. OH MY GOODNESS!! I'm so happy (and jealous) for you!!! That is so amazing!! There's nothing like being rewarded with regular income after so many years of studying and a paltry salary. Congratulations! This salad looks so refreshing and healthy. I've been wanting to do a Meatless Monday. I will have to add this to menu. All the best ...your new job and move! Must be exciting. I'm sure you can whip up something like panzanella salad with the fresh produce in the Midwest. Yes? No? Love this salad. Looks so good! Hi MsMeanie - thanks for vising my 10 secrets to pizzeria quality pizza at home post. Yes, I am a nyc girl. I take it you are too. We left NY when I was 10, but it was definitely my favorite place to live! congrats on the new job! apart from the lack of farmer's market produce it sounds very exciting. and thanks for the panzanella recipe: i have some bread just waiting for a good use like this!